Oren Liebermann: I knew I wanted to write a book when we started traveling, but I couldn’t figure out what made my story compelling. I finally got my answer in Nepal. I had taken notes throughout the trip, and those became the basis for the book. During the trip and immediately after my diagnosis, I never really dealt with the diagnosis emotionally, so there was definitely something cathartic about writing the book. Some of the chapters about the diagnosis specifically were very difficult to write — I’d have to write a few paragraphs and then step away for a bit. In the end, I wanted the book to be funny, honest, and enjoyable. Perhaps most importantly, I wanted the book to be inspiring. I made a very conscious decision shortly after my diagnosis that I would refuse to accept any limits on my life just because I have diabetes, and I hope the book inspires others — whatever condition they’re dealing with — to make that same decision. In a sense, I was lucky to be diagnosed at 31. For 31 years, I could eat whatever I wanted, and for 10 years, I could drink whatever I wanted, and that made it easier to have a very positive outlook despite my diagnosis. I hope to spread that positive outlook to others. DSM: Have you received any feedback from readers with diabetes? Oren Liebermann: I have, and it has been overwhelmingly positive! It’s a blast to share this book with readers who have diabetes. The symptoms before the diagnosis and the emotions of going through the diagnosis are very familiar to those who have diabetes, and I think it’s comforting and reassuring to know that we were all confused in those moments and we were all terrified. But I try to make a point that it’s OK to inject humor into the diagnosis and it’s OK to laugh at diabetes — in fact, I think it’s important to do so — because it makes diabetes that much easier to handle. And I think everyone with diabetes can appreciate that. DSM: When you were initially diagnosed with malnutrition, did any part of you question that? I mean, you’d been eating pretty consistently from what I read; I’d be shocked if you could actually lose 40 pounds while eating every day for two months. Were you so relieved to have any diagnosis that you accepted it? You say in the book that you learned “the brain is wired for denial.” Do you think that played a part here? Oren Liebermann: I think I just wanted some answer — any answer — and I was so convinced that I was generally healthy that I had no problem accepting the malnutrition diagnosis. I made excuses for myself at every point along the way — in Thailand, it was hot; in Nepal, it was the dry season; in Israel, it was a desert — so I was more than happy to believe that my thirst was a consequence of my surroundings, that all I had to do was eat a bit more and eat the right foods and I’d be absolutely fine. I would not let myself believe that there was something much bigger at work. I refused to accept that I might have a very serious chronic disease that needed immediate treatment. I was very much in denial. I wanted to believe that I was fine, so I believed it. And it was as simple as that from my perspective. But after three days of following the doctor’s instructions, it became very clear that I was not fine. I went downhill so fast that I had to go back to the doctor and have him do a second examination. I was so weak and exhausted at that point that I knew something more serious was wrong, and when I finally got the diabetes diagnosis (and had time to truly process it), it helped make sense of a lot of the symptoms I had been experiencing. By then, I was just so happy to find out what was really wrong that there was a sense of relief there…mixed with disbelief and about a thousand other emotions. There was nothing easy about being diagnosed with diabetes — there’s nothing easy about being diagnosed with any disease or condition — but at least it put me on the right track to understanding what I had to do to come to terms with my disease. DSM: You seemed like you got a pretty good grasp on your diabetes and blood sugar control while home for that month break. Did you have experience or prior understanding of the condition? And was it as simple as it sounded? Oren Liebermann: I am the first person in my entire family to have diabetes, but one of my best friends has had Type 1 diabetes as long as I’ve known him. He was the first person I turned to (outside of my family), and he has been my diabetes mentor to this day. I knew very little about diabetes before my diagnosis &mdash ;I had no reason to know anything about diabetes — but I tried to learn as fast as I could. Emotionally, it was very difficult. I lost track of the number of times I broke down in tears early on because it happened so often during the first week. But after that first week, I was able to begin processing what it meant to have diabetes and what I had to do. My doctor explained it best, and he put it in a perspective that made it simple. If your blood sugar is high, take insulin. 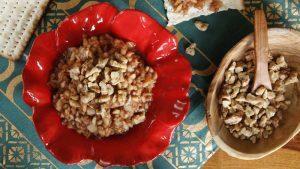 If your blood sugar is low, eat sugar. The treatment of diabetes can be as simple as that, but it requires tremendous discipline in terms of eating the right things and vigilantly monitoring blood sugar. The actual science of what was happening inside my pancreas and inside my body didn’t interest me at first because it didn’t help me in any way. I needed to know how to manage diabetes, not try to cure it, so that’s what I focused on. Learning what foods to eat, what to avoid, how much insulin to inject, and how to deal with blood sugars that were too high or too low. I didn’t go on an insulin pump or a continuous glucose monitor because I felt that would add complication where I didn’t need it. I have my regular ol’ blood glucose monitor and my disposable insulin pens and that’s what I’m sticking with. They work well for me. DSM: Why did you wait only one month to continue your trip? Were you afraid of losing that traveler’s momentum, or was there another reason? Oren Liebermann: We definitely didn’t want to lose that traveler’s momentum. We were in love with traveling, and we were eager to finish what we started. For me, it was a function of figuring out how long it would take me to understand how to manage my blood sugars well. Then we would get back on the road. 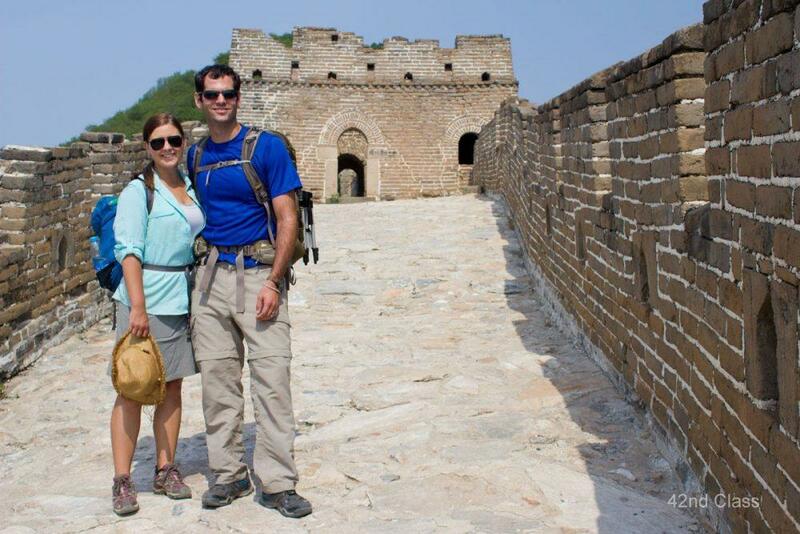 Oren and wife Cassie at the Great Wall of China. I also felt that the longer we stayed at home, the less likely it was that we would get back on the road, so it was important for us to get back to traveling fairly quickly. 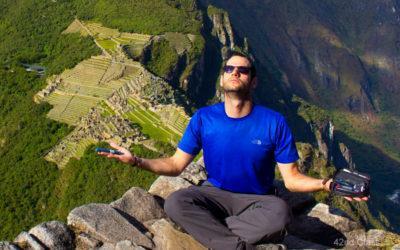 I consider it the most important decision I have ever made — the decision to keep traveling. It certainly wasn’t the smartest or most responsible decision (to which my parents will happily attest), but it was the most important decision. I knew that if I accepted limits that quickly to what I wanted to do, I would always accept limits. If I said “no” that first time, it would always be easy to say “no,” and I didn’t want to think like that. So we got back on the road as soon as we could! I immediately started writing down all of my blood sugars and all of my meals and all of the insulin I took to get a solid grip on my blood sugars as quickly as I could. And it worked! I rounded up all the supplies I needed, made myself a little “diabetes toolkit,” and carried that around everywhere with me when we started traveling again. We visited my doctor a couple more times to get some feedback on adjusting levels of insulin, and after a month, we felt we were ready to travel again. My doctor agreed, even if my parents disagreed. Oren Liebermann: Ha, no! I have to say this was not my chosen title. My title was “Home is a Verb,” a title I still like. 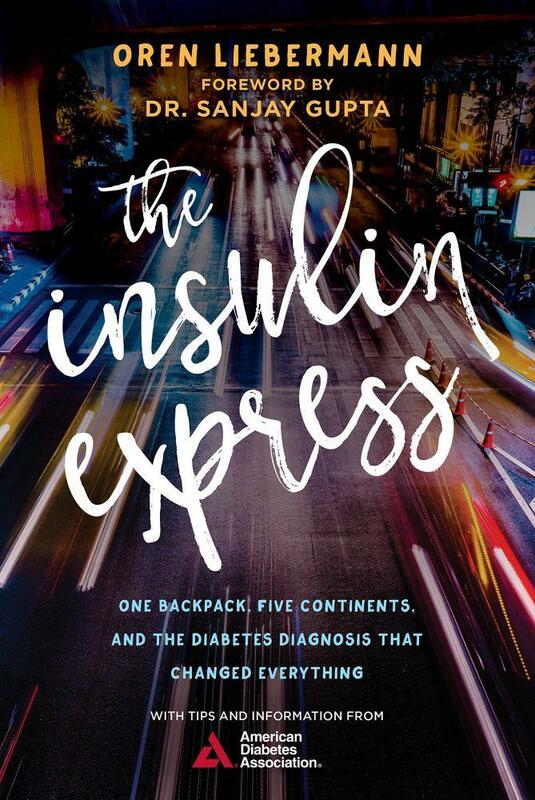 But the publisher felt it wasn’t the right fit, so we came up with “The Insulin Express.” I have to say, I now love the combination of the title and cover! DSM: How do you balance your job as an international journalist with diabetes self-management? Oren Liebermann: The first thing I did when I walked into my office in Jerusalem was told everyone that I had Type 1 diabetes. I showed everyone my insulin, my blood sugar monitor, and my glucagon shot, and I explained to them what everything does. I taught them about diabetes and what to do in case of an emergency. That was a huge help, because now my team is always willing to help when I need it. But that doesn’t mean it’s always easy. I’ve had a couple of bad lows before live shots, and those are very tough to deal with, especially on complicated stories that require very specific wording. Days in the office are always easier than days in the field. In the office, I can easily check blood sugar and there is always emergency sugar somewhere nearby. Days in the field require a bit of planning. I need to have a good sense of when I will eat, and I need emergency sugar with me. It can be tough to vigilantly monitor blood sugar on days in the field, so I try to run my numbers a bit higher to make sure there is always a bit of a buffer zone — somewhere in the 150&mndash;180 range. I consider diabetes self-management to be part of the job, and a very necessary one at that. I always have to monitor the news around me, and I always have to keep track of my blood sugar. The two are different aspects of the same job. I’m also trying to do a bit more advocacy work on behalf of diabetes since I have a very public platform with CNN. I’ve already decided that I will be posting all of my blood sugars on Instagram and Twitter for the month of November, which is Diabetes Awareness Month. DSM: Do you have another trip planned? Oren Liebermann: Always! We have tried to add two countries a year since we finished our big trip. Our upcoming trips are Greece and (maybe) the Philippines! This year, we’ve added Cyprus, Russia, and we made a quick trip through Belgium, Holland, Germany, and Luxembourg (which are all very close together). DSM: Finally, did you ever do a Google facial recognition search to see if you could find any photos online that you took with all those strangers in China? Oren Liebermann: Not yet, but I will definitely let you know the results! Want to learn how other famous people are living with diabetes? Read about James Earl Jones and Nick Jonas.